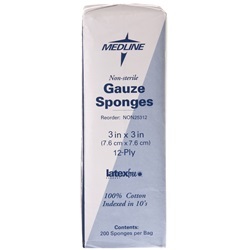 Gauze Pads - Medline 12 Ply, 3" x 3"
Non-sterile gauze sponge measures 3"x 3" and is made from 12 ply cotton. Latex free. Manufactured by Medline. Comes 200 per pack. Our strictly controlled manufacturing process assures clean ,debris-free packing with folded edges to prevent unraveling.